Jennifer Beattie's hat-trick helped Arsenal beat Barcelona 4-0 and reach the Women's Champions League last 16 with a 7-0 aggregate win. Beattie and her Scotland colleague Kim Little scored within four minutes of each other early in the second half. Barcelona failed to get a single shot on target and substitute Beattie struck twice more in the last 12 minutes. 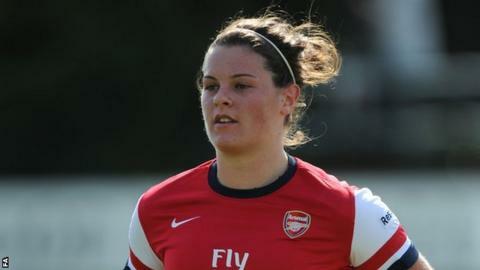 "I was pleased for Jennifer," said Gunners boss Laura Harvey. "She was very sharp when she went on." She added: "In the first half we played like a team who didn't have to go the extra mile because we'd started with a three-goal cushion. "But we went into the second half with a nil-nil attitude and it was a clinical performance that brought us a well-deserved win. Having won the first leg 3-0 in Spain, Harvey's team produced a controlled performance that brought them a comfortable passage into the next round. They posed by far the greater goal threat throughout and twice went close to taking the lead in the opening half-hour. Left winger Rachel Yankey's 15th minute cross-shot was saved under the bar by goalkeeper Laura Rafols. And Rafols then made a fine diving stop from a 20-yard Jordan Nobbs strike. Left-back Steph Houghton sent a 20-yard free-kick skimming over the bar in first-half stoppage time as Arsenal continued to probe without success. But goals looked inevitable and the game and tie were unequivocally over as a contest following the quick-fire strikes by Beattie and Little. Beattie, a half-time substitute for England striker Kelly Smith, firmly headed home a 53rd-minute free-kick by Yankey. And four minutes later the winger crossed for Little, beyond the far post, to score with a superbly struck volley. Little and Houghton were denied by brilliant saves from Rafols as the Gunners looked to turn the screw. But the keeper could not keep out Beattie's powerful 78th-minute header from another fine delivery by Yankey. And three minutes into stoppage time Beattie completed her hat-trick with a penalty after substitute Ellen White had been brought down by Rafols. Arsenal will face a much tougher task in the next round as they take on the German champions and twice Euro winners Potsdam. The Germans beat Belgian outfit Standard Liege 8-1 on aggregate to reach the last 16 and, like Arsenal, have never failed to reach at least the Euro quarter-finals. But they have lost several key players this season and Harvey said: "If you go on Potsdam's reputation we'll lose, but I don't think they're quite the force they were. "We've never beaten a German team, but I honestly believe we've got a fantastic opportunity to make history and put ourselves in the last eight again."